Exactly like a human athlete, your canine athlete needs protein to help maintain his muscles and help prevent injury. Some fat is also important to maintain your hunting dog’s energy while on the hunt. Both of these desired ingredients can be found in a higher quality dog food blend that provides more nutrients. Buying one of these blends may be more expensive but the food that your dog eats will not include any "empty" calories that your dog doesn’t need. 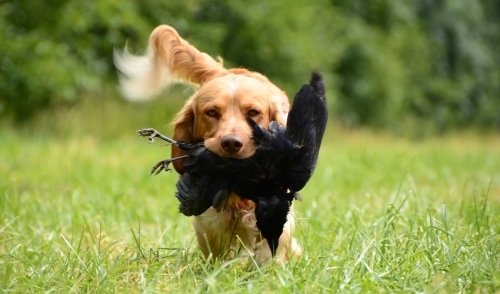 When you’re on the hunt, your dog is undoubtedly doing a lot of running around after the game you’re aiming for. Just like many activities your dog does, he’s going to need to drink water to stay properly hydrated. Always carry around something that is water-tight so you can stop and give your dog something to drink. You will definitely see the difference in his performance.